Colour is important too, a dark floor can make the room seem smaller, but light coloured floors really show up any dirt and marks, so it means you will have to clean them more often. Of course, you need to consider the material of your flooring as well. A popular choice at the moment is a hardwood floor, and they are hard wearing and look very attractive. The same goes for a slate floor, but they can be a little cold unless you are springing for underfloor heating as well. Something else that should not be ignored when renovating a kitchen is the lighting. Lighting can change the whole look of a room, making it seem larger, or cosier depending on what is chosen. Good lighting is also important in the kitchen because of all the tasks that are performed there, you definitely want to have good light in the places that you are using sharp knives or handling hot pans. Make sure there is enough light around the higher risk areas by installing something like this LED Lighting from Bright Lightz. They will make sure that there is enough light to work in safety, without breaking the bank. 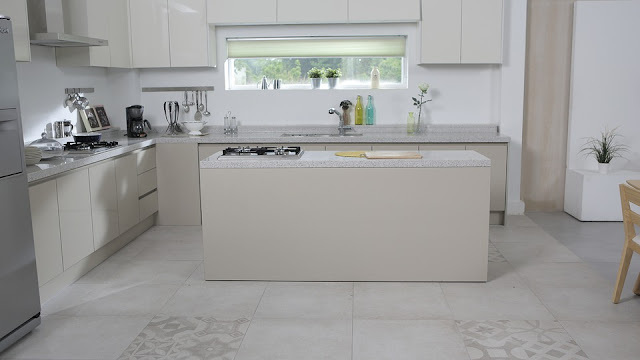 A massive area that needs attention in a kitchen renovation are the worktops. All too often it is the worktops that can give the age of a kitchen away, this is because of two reasons. The first is that the style can date them, especially with the cheaper options. The second one is that out of everything in the kitchen, worktops are one of highest use areas. That means they will suffer a lot of wear and tear and so may age more quickly than other parts of the kitchen. When it comes to replacing them, do you best to select something neutral that won't age too fast. Granite worktops are pricey but very hardwearing and attractive, so they make a good long term investment for that expensive kitchen look. If you are looking for something a little more reasonable then varnished wood can look great, but it is harder to keep it in mint condition, because of all the water used in a kitchen! What ever you choose, go with your gut instinct.